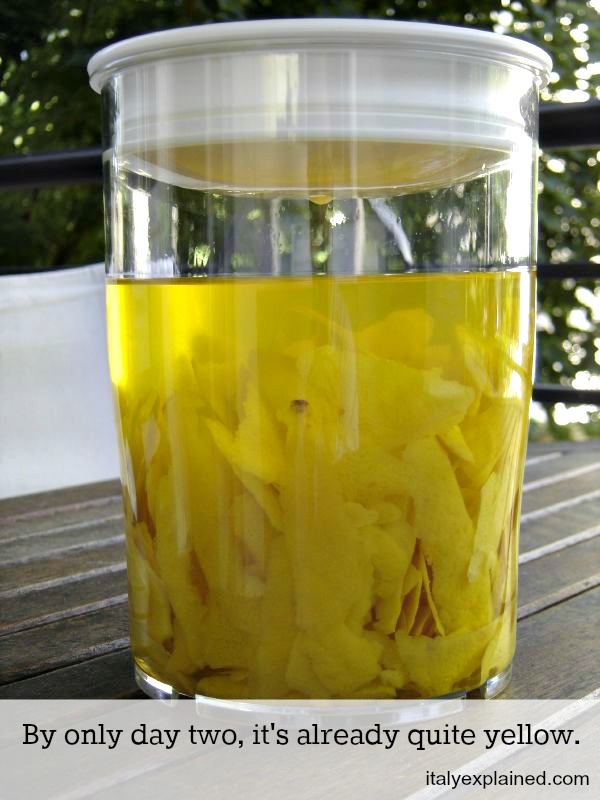 With the holiday season fast approaching, I wanted to dust off one of my favorite Italian DIY gifts ever – limoncello – by sharing the recipe I use for it. 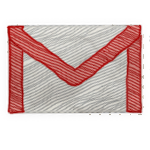 If you get started soon, you’ll be able to make it in time to give as holiday gifts this year. Or, y’know, keep it all for yourself. I won’t judge. Limoncello is a strong and sweet liqueur that’s popular throughout Italy. 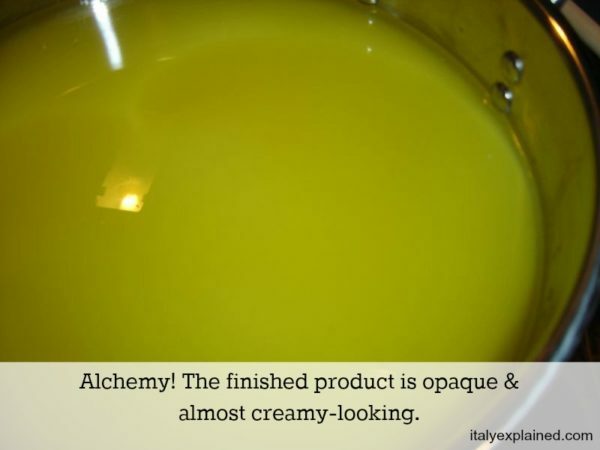 It originates primarily from the Italian south, where high-quality citrus grows in abundance. It’s excellent as an after-dinner drink – I’ve been known to have some in lieu of dessert – and is served in tiny glasses. This isn’t something most people will want to drink in large quantities. The Italian woman who gave me the recipe below uses grain alcohol to make it, as do all the Italians I’ve spoken to about homemade limoncello. Some people, however, like using vodka better (and, in some states, liquor stores aren’t even allowed to sell grain alcohol). Your mileage may vary if you use this recipe with vodka – I believe it takes longer – but experiment with it to see what you like. Also note that this basic recipe can be used with any citrus. Limes, oranges, and grapefruit all make fine liqueur flavors with this same recipe. You’ll just need to adjust the amount of fruit based on its size. 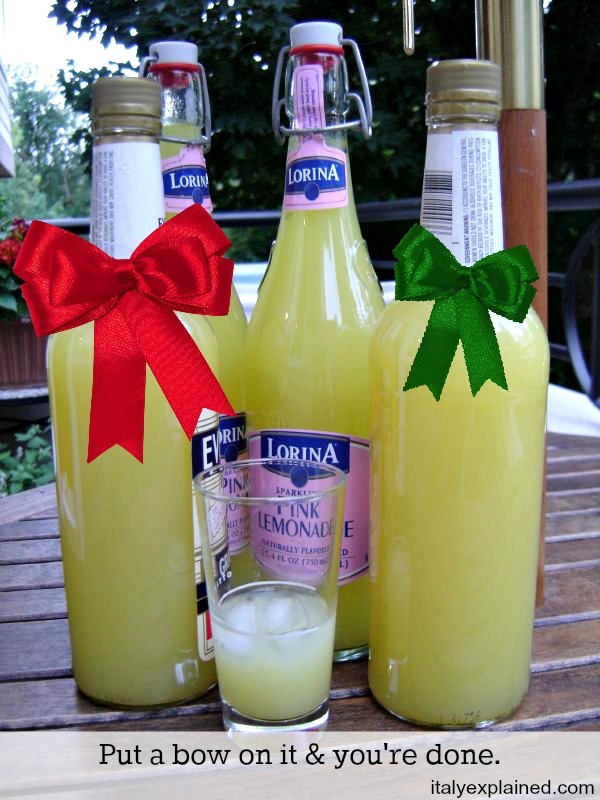 When you’re giving limoncello as gifts, consider picking up some small, decorative bottles for that purpose. Sur La Table often has them, IKEA has some that are larger (if you’re feeling generous), and you can find plenty of options online, too. Just make sure it’s a bottle that seals tightly, so it can be laid on its side in the freezer if need be. For the portion I keep for myself, I simply decant it back into the empty grain alcohol bottle. Start by washing all the lemons completely. 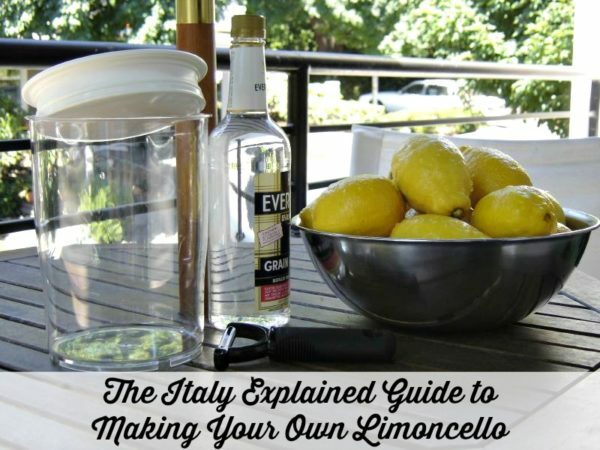 Ideally, the lemons you use for limoncello are organic and have never been sprayed. This is important because you’ll be using the peel rather than the juice for this recipe. Even if they’re organic, however, I still wash my lemons. There are produce rinses you can get that remove any remaining residue. 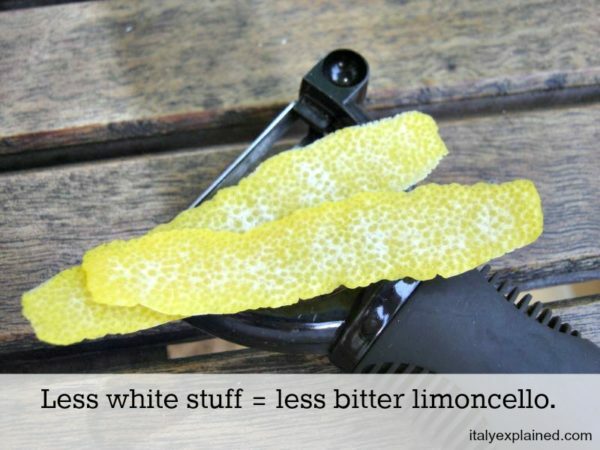 Get a good vegetable peeler and get all the bright, yellow lemon peels off of the lemons. 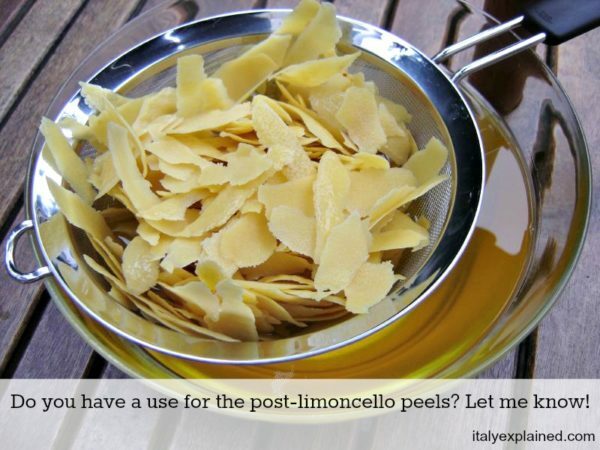 You want the peels to be as thin as possible, taking as little of the white “pith” with them when you’re peeling. That white stuff can impart a bitterness to the finished product that you want to avoid as much as possible. 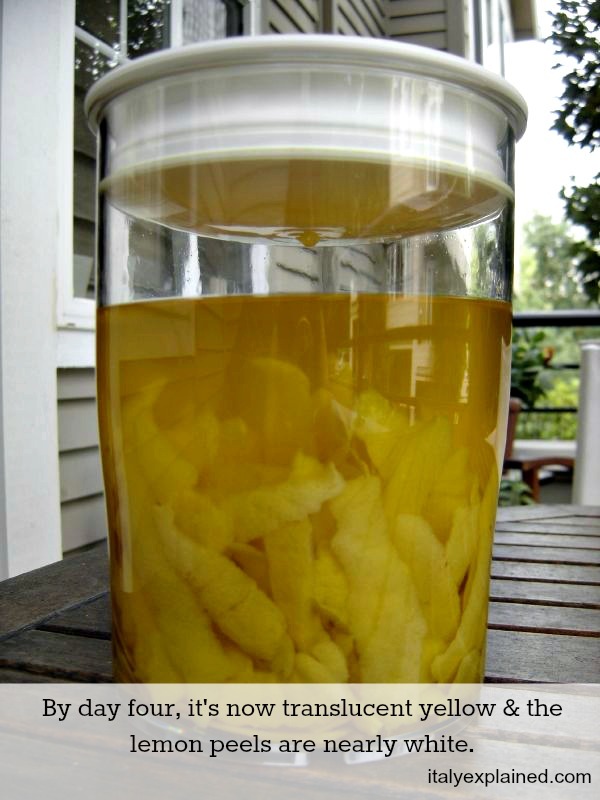 All of the peels go into the large jar you’ll be using. It doesn’t much matter if it’s glass or plastic, just that it’s big enough so that there’s room for shaking the heck out of its contents, and it has a lid that will seal tightly and not leak during said shaking. Put the date on the outside of the jar so you know when you started the process. 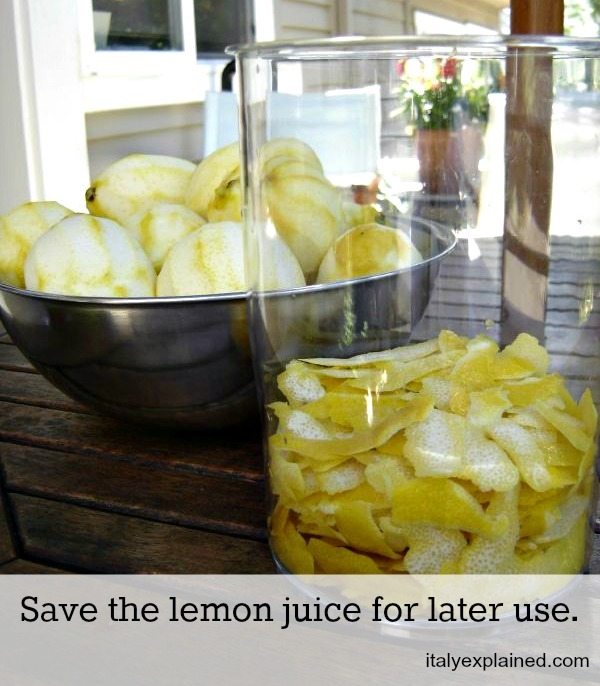 Add the grain alcohol to the jar along with the lemon peels. Stick the jar in a cupboard or another spot that’s cool and dry. It’ll sit in that spot for one week. 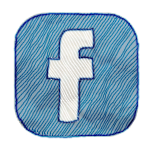 On a daily basis, take the jar out and – as mentioned – shake the heck out of it. 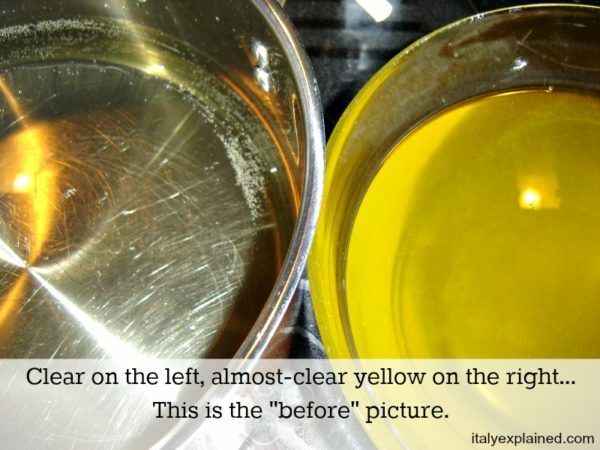 Each time you peek at the jar, the color of the liquid will (should) appear more and more yellow, as the peels themselves lose their color. After one week, put the water and sugar in a pot on the stove and heat them together until the sugar is completely dissolved. It doesn’t even need to simmer, it just needs to heat enough to dissolve so that the liquid is clear again. 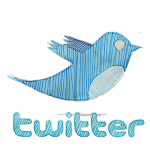 (This is, by the way, a kind of simple syrup. I say “kind of” because it’s not 1-to-1, but you get the idea.) Oh, and I once tried to use that “raw” sugar, the one that’s not completely white, and the resulting limoncello tasted okay but looked like it had an odd brown film floating in it. I stick to white sugar now. Set this sugar-and-water mix aside so it can cool completely. 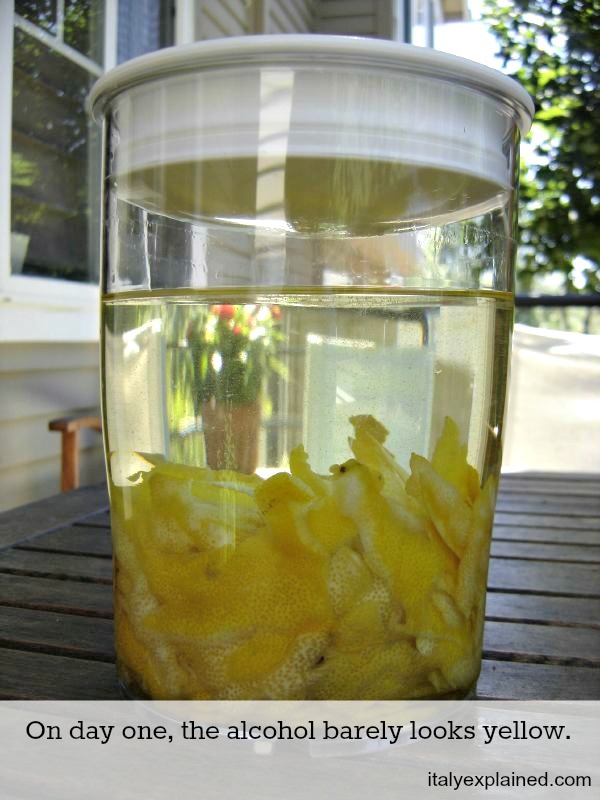 Pour the lemons-alcohol mixture through a strainer to catch the used peels, catching the intensely yellow alcohol in a bowl. And now we get to the fun part. Combine the cooled (and clear) sugar-water mixture with the (mostly clear) yellow alcohol. The liquids, when combined, should turn a sort of milky, cloudy yellow color. It’s a magic sort of alchemy every time I see it. This is your finished limoncello, so all you need to do now is funnel it into the bottles you’re using, put some labels and bows on them, and they’re ready for gifting! I store mine in the freezer (it keeps the consistency thicker, more toward the “syrup” end of the liquid spectrum, which helps make it a more dessert-y beverage in my opinion). In that last photo, there are ice cubes in the glass because I had just finished the limoncello and it wasn’t cold yet, but normally I just pour it from the freezer-stored bottle into a glass with no ice at all. This homemade stuff won’t last forever (eventually it loses much of its sweetness), which is another reason to put it in smaller bottles to give as gifts. Oh, and I’ve never tried to do anything with the spent lemon peels (they’ve surrendered all of their lemon-ness to the alcohol, and are hard and brittle, so I can’t quite imagine what they’d be good for), though I’ve heard some people candy them. I do squeeze all the lemons afterward and freeze the juice for later use, though. 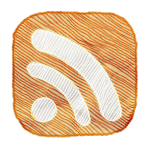 Do you have an Italian DIY goody you like to make at this time of year?